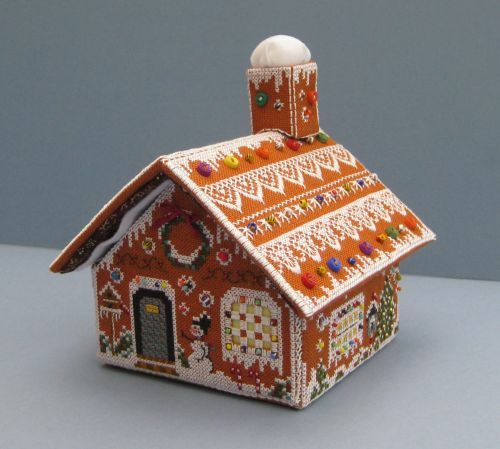 Now that Christmas is out of the way, I can show off the completed Gingerbread Stitching House which I made from a chart booklet from Victoria Sampler. The first image shows it assembled as far as the main house goes. 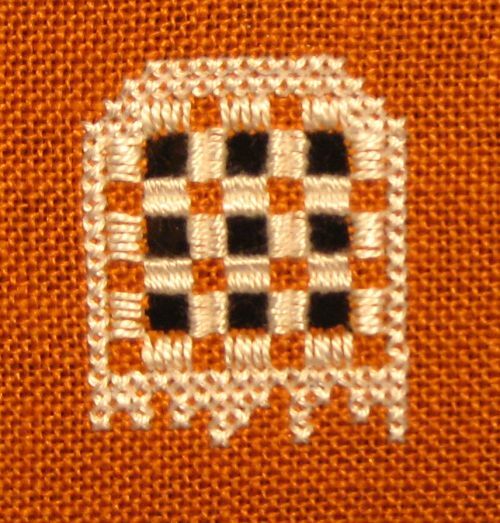 The second image shows the hardanger window, lined with yellow cotton fabric. With hindsight, I think red would have shown up better, but I thought red would clash with the orangey colour of the evenweave fabric. The panels are attached to each other by working slip-stitches through the back stitches that are worked around all edges of the main pieces, lacing them together. I found this to be very neat and successful. The lining worked out very neatly in the end, although I did have to trim all edges of the card pieces several times to make them small enough to work, and not buckle. The instructions given in the chart pack didn’t quite work for me. 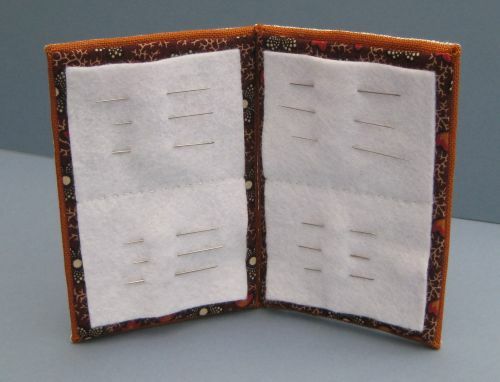 The roof lining contains this needlebook, with white felt pages. 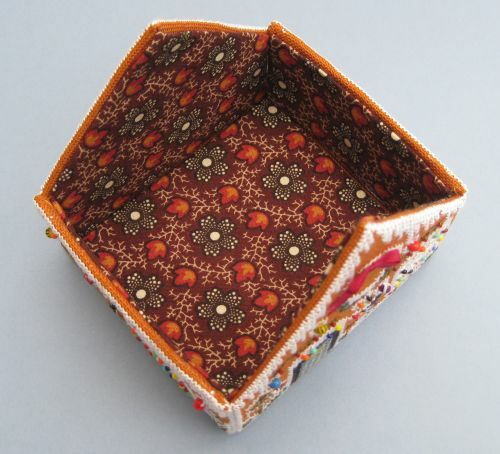 The instructions suggested making a felt pocket for one side of the roof, to store scissors in, but I preferred to have needle storage on both sides. The chart book’s instructions suggested making a fine cording (although it didn’t say *how* to make the cord, just to make one!). I didn’t feel mine needed a corded edge, so I left it plain. Here is the completely finished house. 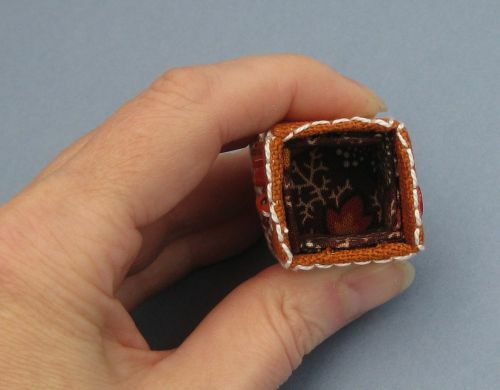 It measures about five inches by four, and about four inches high. Isn’t it wonderful?! I’m so pleased with it! 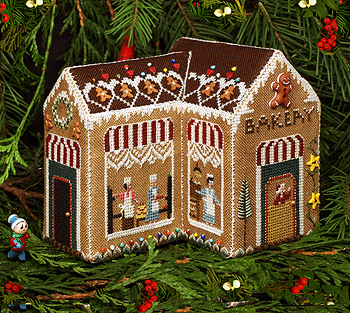 Just as I get that one finished, and feel that I’m getting somewhere with my backlog of ‘things I must make in this lifetime’, I found out that Victoria Sampler have brought out a Gingerbread Bakery, and a Gingerbread Needlework Shop (which is a box with a lift-off lid, not just a model, as the bakery is). Oh dear, I feel more purchases coming on! The design itself is cute, with lots of areas of interest. It’s been well thought out. However, the production of the chart booklet lets it down somewhat. 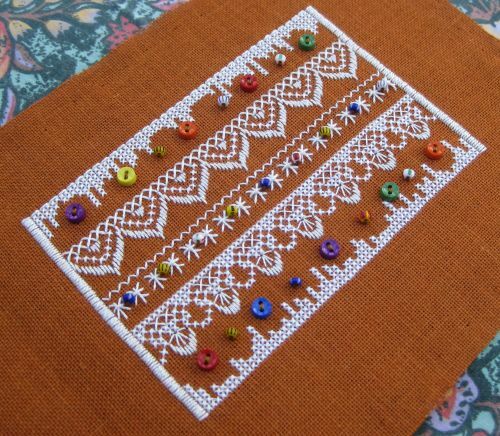 The booklet contains several spelling mistakes, including one regarding the size of backstitch outlining to work for the base. This is quite annoying! I contacted the customer services person at Victoria Sampler, and she said I must have an early version of the chart booklet, as that has been corrected in later versions. The chart pack is reasonably priced, and it is printed on good quality paper. I scanned the charts and printed them out so that I could colour in some areas as I stitched them, as the paper in the booklet is too glossy to use coloured pencils on. Although the chart pack is reasonably priced, the Accessory Packs are quite expensive – the main one doesn’t contain the DMC 12 or 8 Perle thread balls, or the Kreinik Mori thread – you need to buy a second accessory pack for those. Kreinik Mori is an expensive thread, and no quantities are given as to how much you might need, if you wanted to buy your own, which I found unhelpful. But it is easy to buy your own supplies instead of the Accessory Packs, if you look carefully at the product pictures on the Victoria Sampler website first to see what you’ll need. I thought at first, for the cost, that whole skeins of the threads needed would be included in the Packs, but that’s not the case. You get half yard or full yard cuts. So, raid your stash for similar colours for the threads, and do Google or Ebay searches for the tiny buttons, etc., to find suppliers, if you don’t intend to buy the Accessory Packs. They are not hard to find. I’ve mentioned this before, but if you’re in the UK and thinking of buying this chart pack (and the Accessory Packs), get it from Sew and So, as the shipping from them is only a token £1 – far cheaper than International postage from Canada!! 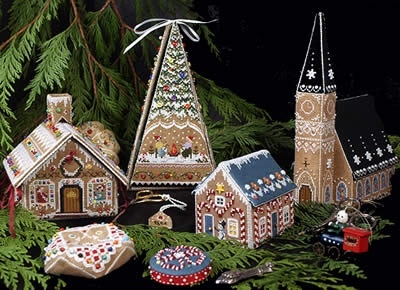 When I first decided I’d like to make this Gingerbread Village, the Tree Etui design was only available if you did an online course with Victoria Sampler, but it’s since been released as a chart pack, like the other designs. So, I have bought the chart for that one too, now, and that may be the next one in this series that I make. 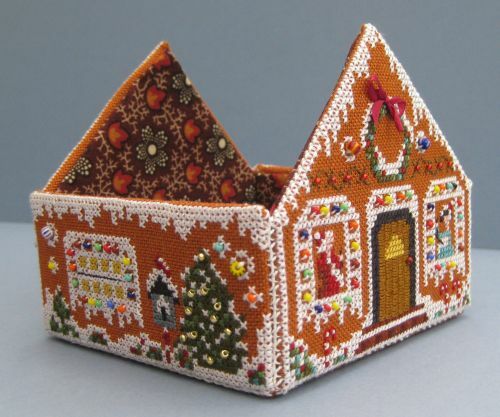 Although I’m tempted to make another Gingerbread Village item next, other items from my stash drawer are calling, and I need to get back to the Carolyn Pearce Home Sweet Home project, too…. 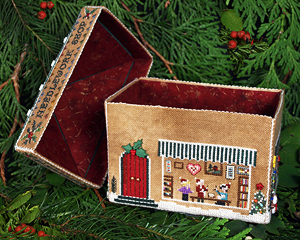 I was quite apprehensive about assembling the pieces of stitching to make the little house, once I’d done all the sides and roof, as I thought it might end up being bulky. There were lots of layers to neatly put together, and as I’ve got no patience, there was a distinct possibility that I could spoil it all at this point. 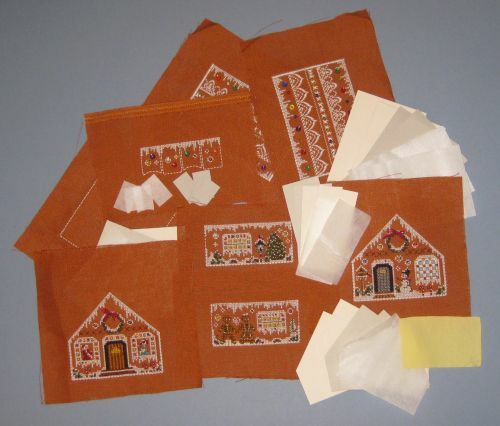 The instructions in the chart pack from Victoria Sampler said to glue the cross stitched pieces to card liners, after having ironed interlining on the back of each piece. I am always a bit wary of letting glue anywhere near stitching – especially if it has taken me hours and hours to make it!! I decided to compromise, and hand-stitch the mitres on the corners first, and glue only the straight sides, as I felt that would be more likely to be successful. I ironed all the seam allowances over first, to get clearly defined edges to work with, and that helped a lot. With the lining pieces (using a lovely piece of cotton quilting fabric, stolen from my quilting material stash), I *did* glue the corners as well as the straight sides, as that fabric was much thinner than the evenweave I’d used for the cross stitch, so it was much more maneagable. After each piece of stitching and corresponding lining piece had dried thoroughly, I stuck the correct pairs back to back. 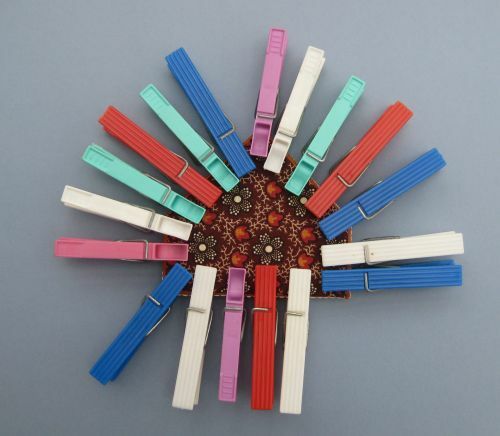 As was suggested in the instructions, clothes pegs helped hold the pairs together as the glue dried. So, it’s all coming together nicely….. 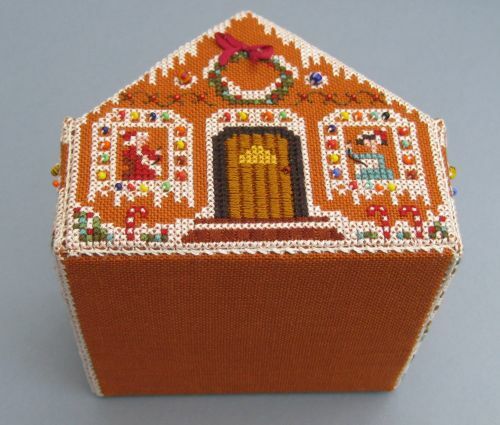 The Gingerbread Stitching House by Victoria Sampler that I am making has an ingenious pincushion incorporated into the chimney of the etui. It is an open, four-sided box-like structure, shaped along the bottom edges so that it sits on the roof, so that it can be lifted off when needed. The ‘smoke’ coming out of the chimney is the actual pincushion part. Clever, eh? It was quite fiddly to make, but good when it was done. 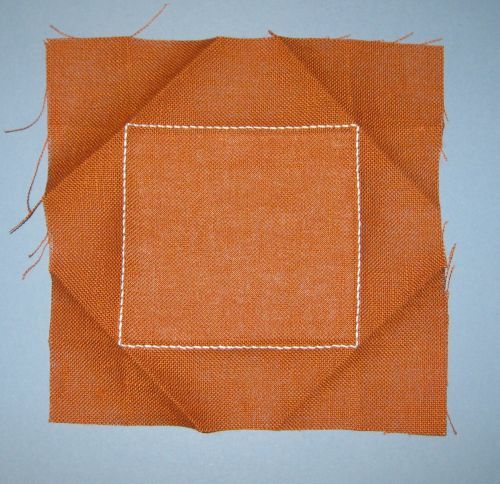 The stitching itself was quick, and simple to do. Buttons and a few beads were attached next. 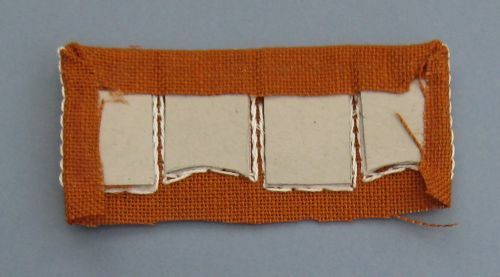 After trimming the fabric, it was strengthened with pieces of Vilene interlining, and then the fabric was stretched over pieces of card and glued in place. 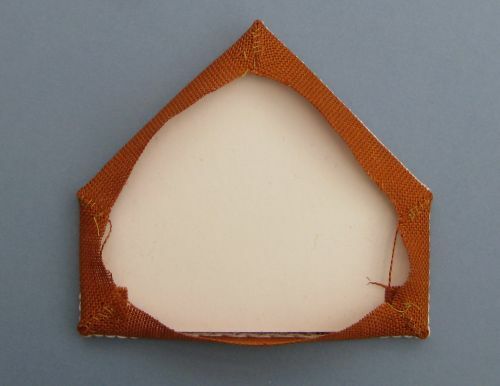 Lining ‘squares’ mounted on card were then stuck inside the backstitched outlines for each side of the chimney. 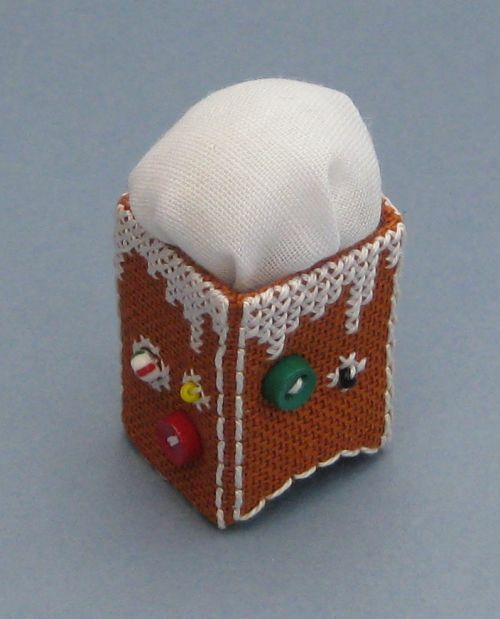 The ‘smoke’ for the pincushion itself was made from a circle of white cotton, 3 inches in diameter, gathered with a running stitch around the edge, and stuffed with a little wadding. The chimney was slipstitched into a tube, and the ‘smoke’ stuck down in place. 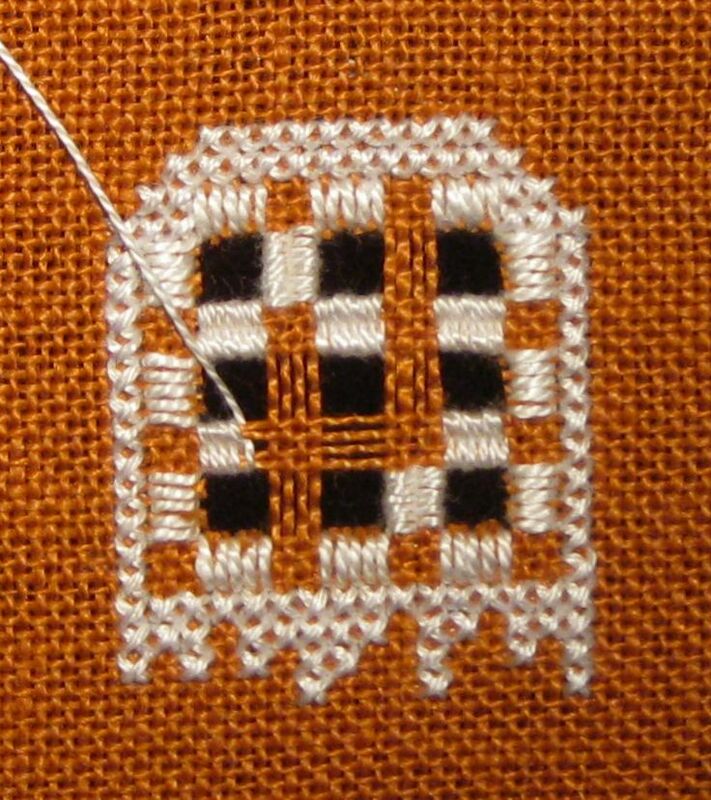 The back panel of the Gingerbread Stitching House by Victoria Sampler that I am stitching has a hardanger window, which is then backed with contrasting fabric to give the impression of light showing from inside the building. 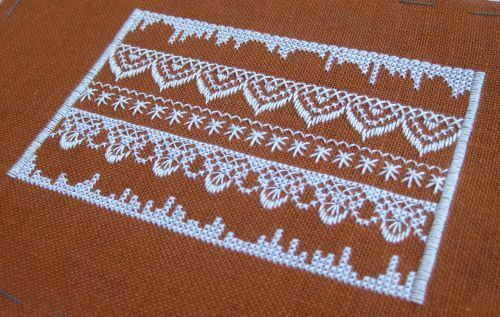 I hadn’t ever done hardanger before, as it doesn’t really appeal to me as a technique. For a while, I considered altering the design and just working it all in cross stitch but then I thought I’d have a go anyway, and was surprisingly pleased with the result. 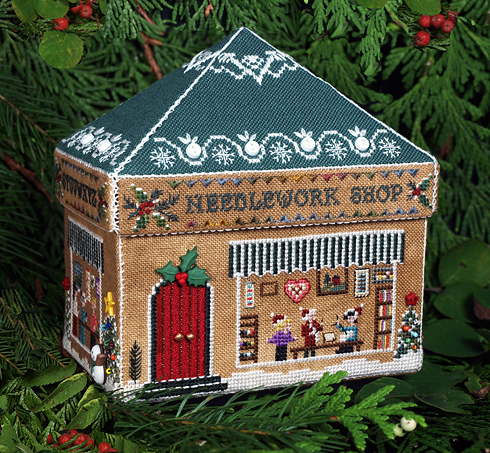 The roof is stitched all in white, using cross stitch and various counted thread stitches. This was pretty when it was finished, but BORING BORING BORING to stitch. I remembered, part way through, that I don’t like stitching with white. 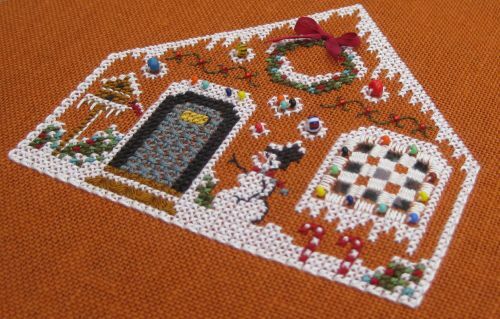 Pretty stupid to decide to stitch a design that features lots of decorative ‘snow’, then, really, wasn’t it?! 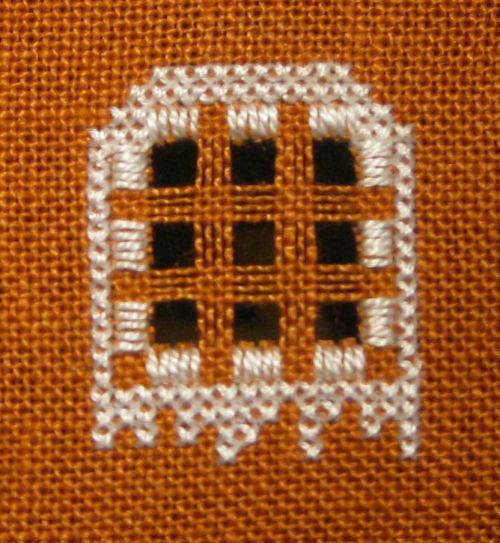 I also realised that, as I’d substituted an Anchor stranded cotton for the Kreinik Mori thread that was suggested in the chart pack, the whites I was using weren’t all the same shade of white, and in some types of lighting, that notices. DMC Perle 12 and 8 White are not the same as Anchor stranded cotton number 01 White. Oh well. All of that is disguised somewhat by the beads and buttons that are stitched on last, as they grab the attention much more, fortunately.